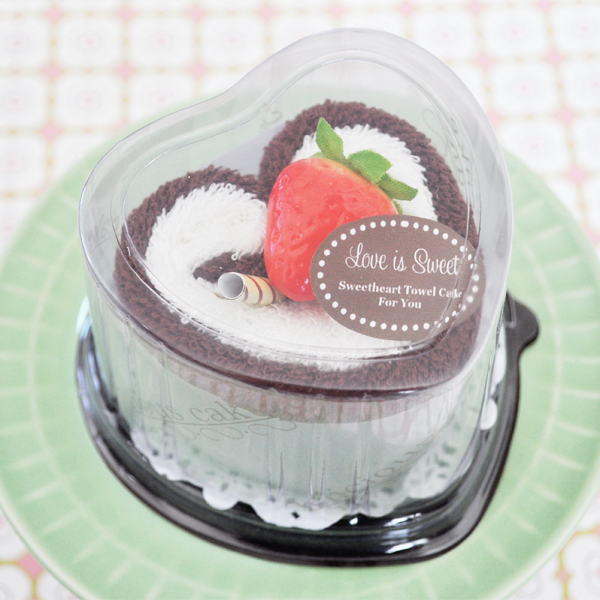 This "Love is Sweet" sweetheart towel cake seems like a delectable dessert but is actually 2 beautifully folded and decorated hand towels! These towel wedding favors are the perfect accent to a wedding, bridal shower, or even a baby shower. 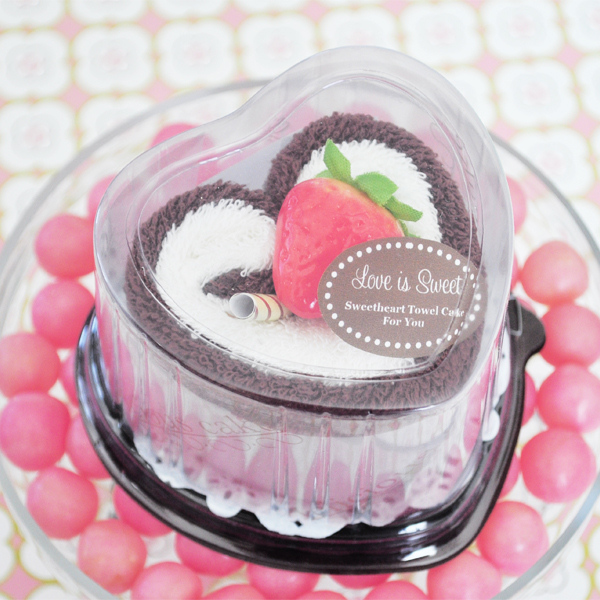 Made of 100% cotton, these towel cakes are topped off with faux wafers and decorative strawberries and then finished with a message that reads "Love is Sweet". 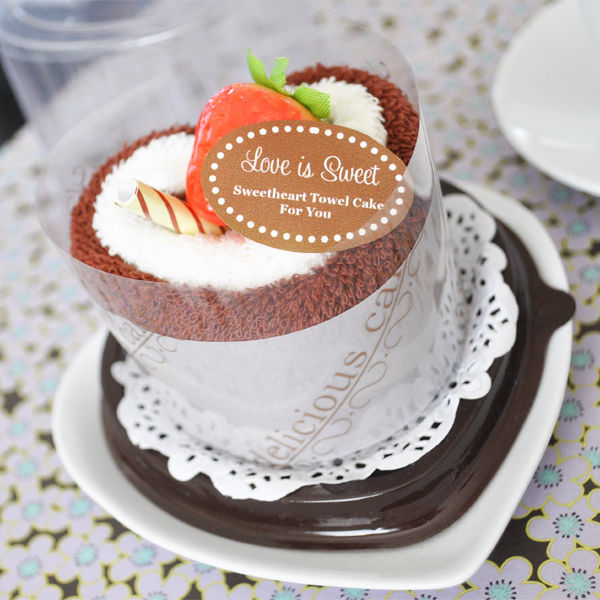 Towel cake rests on top of a doily and is packaged in a clear heart shaped box with brown base. Made with two 8" x 8" 100% cotton hand towels (one white and one brown). Packaged favor measures 3.25" wide x 3" high. NOTE: Closeout item. All sales final. 12 or more required for purchase. I am looking at purchasing the Love is Sweet towel cakes for my niece's bridal shower. The samples show 4 different types. I am planning on ordering around 50. Do they all come the same or do they send various samples? you will see they're all brown depending on your computer brightness/color. The color looks different because of the cover but it's actually all brown. Can the hand towels be personalized? 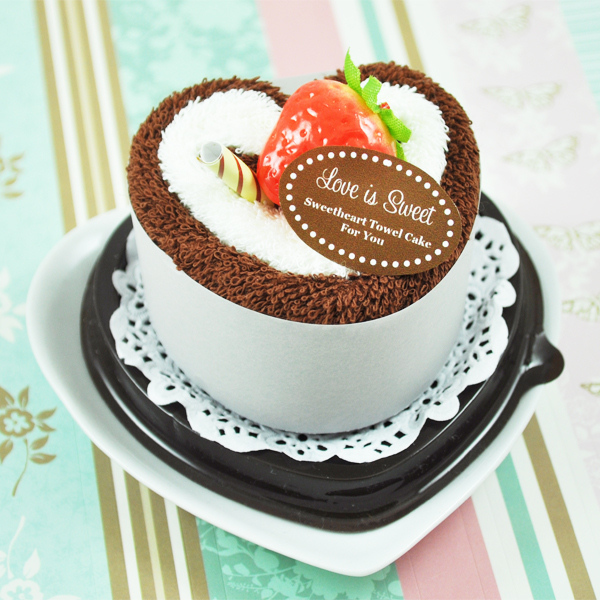 I'm sorry, the Sweetheart Cake Towel Wedding Favors can't be personalized but you can purchase a personalized tag separately here. There are 4 samples. Do you pick which one you want or do you get assorted cakes. I need to order 50. Thanks for your inquiry! There's actually only 1 favor, just 4 pictures of it being presented in slightly different ways. My apologies for any confusion. Thank you!